Flyworld Trampoline Park is Williamsport’s best choice for serious airtime fun. Get ready to take flight. Jump times are started every half hour. (11:00am, 11:30am, 12:00pm, etc.) We recommend coming 10-15 minutes before to purchase your tickets. Tickets can also be purchased on our website. Reservations are not required, but they are recommended on weekends. Occasionally certain timeslots will reach maximum capacity. We do not take reservations over the phone; please reserve your times by purchasing your jump tickets on our website. I purchased Jump Passes online and I am running late/can’t make it. Unfortunately, your jump time is non-transferrable. Please plan on arriving at least 15 minutes before your jump time is set to begin to allow for waiver check in, and purchasing our jump socks (if you don’t already have them). Your jump time will begin promptly at the time you chose. What is a Waiver? Why do I need a waiver? Where can I sign a waiver? Libaility waivers explain the risks associated with jumping on the trampolines. They also allow the participant or legal parent or guardian of the participant to accept full responsibility for those risks. Everyone who plans to participate in our activities at Fly World or LaserQuest will need to have a valid, signed waiver on file, regardless of age. Anyone who is under the age of 18 will need to have a legal partent or guardian fill out a waiver for them. Waivers can be filled out online, at kaosfunzone.com, in the Fly World lobby, or at the Liberty Arena. Waivers are only valid for one year only. Addionally, we upgraded our systems in June of 2018. Any waivers filled out prior to this will need to be signed again. We have a trained staff, and extensive safety rules. Trampolining is considered an extreme sport, such as skateboarding, skiing or snowboarding, or rock climbing. It is always important to jump within your ability and do not attempt maneuvers outside of your skill level. What are jump socks? Why do I need them? Jump socks have rubber on the bottom of the sock. These socks minimize the risk of slipping and falling while on the trampolines. Every jumper is required to have a pair. Socks can be purchased at the Fly World front desk. Already have jump socks? They are reusable! Bring them with you to save a couple bucks! 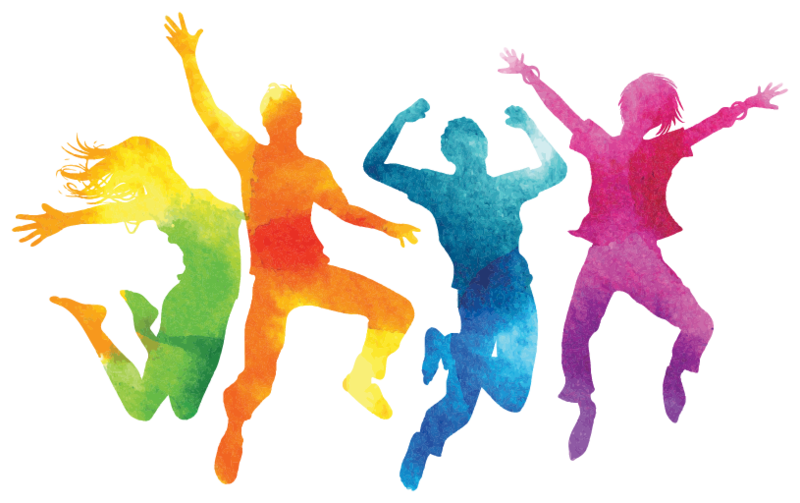 We do not have an age restriction for the trampolines, as long as participants can walk on their own we will allow them to jump. We have a designated section for ages 5 and under and a Little Flyers program on Saturday mornings from 10am-11am for ages 8 and under. I don’t want to bounce, but I want to watch my child jump. Is this allowed? Parents are allowed on our jump platform as long as you are wearing socks. Shoes are not allowed. 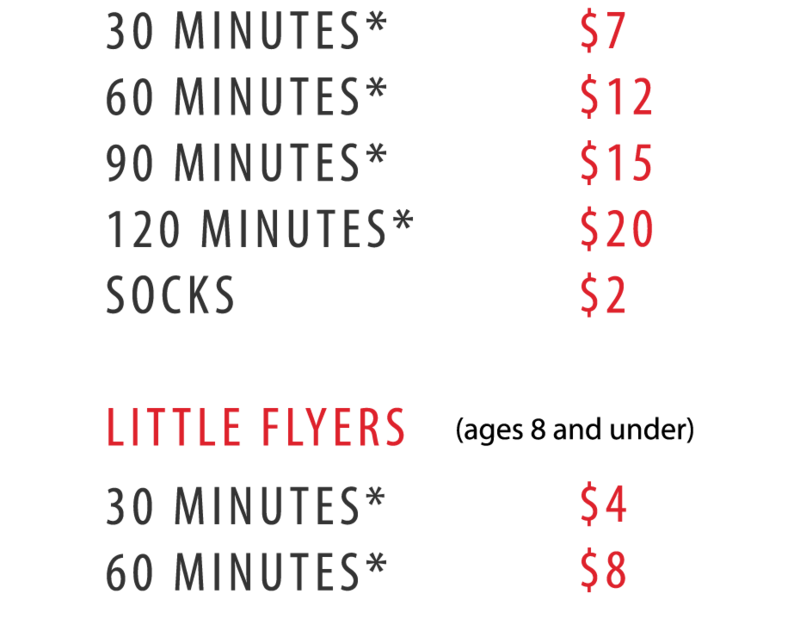 If you plan to get on the trampolines, you will need a ticket, valid waiver, and jump socks. Can I leave my kid there to jump and go somewhere else? While we do have court monitors to enforce our rules and make sure everyone has fun, we do not recommend leaving your children while they jump.